I think I need to start blogging every day again about my spinning practice. It helps keep me focused. Also, it helps me pin down details about what I’m doing and gives me a way to look back if I want to. So. 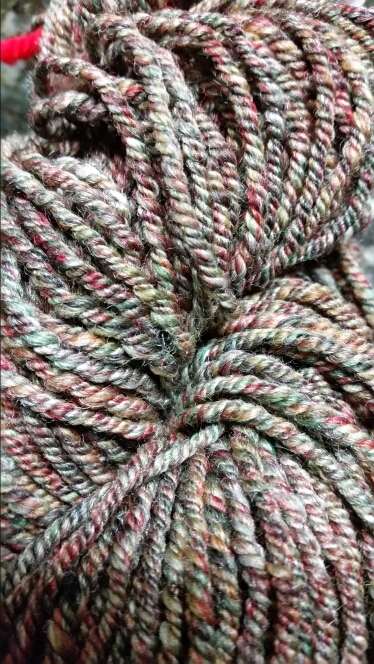 In my last post, I described the merino-silk blend and how I was practicing spinning thicker. Well, I did that and was actually pretty successful at keeping a consistent diameter over the whole 8 ounces. What was really interesting was what happened with the twist. I got a graphic example of how thickness and twist interact with each other. When I tried spinning thicker at the higher ratio (10:1) that I had used when spinning thinner, I got a LOT of twist in the singles, and plying at the related higher ratio (9:1) gave me a VERY tight yarn. You can see that here. So I backed off on the ratios (8:1 spin, 7:1 ply) for the next batch, and WOW what a difference. For this particular fiber, I like the lower twist much better. It feels better, and the colors are more vivid. The 3-ply yarn is about 7 WPI, which puts it in the Aran/Chunky weight range. I have more of this fiber in a different colorway, but I’m going to save it for later. Right now I’m interesting in spinning silk fiber, because I bought this gorgeous silk lap in Texas, but I want to get some silk practice in before I touch it. 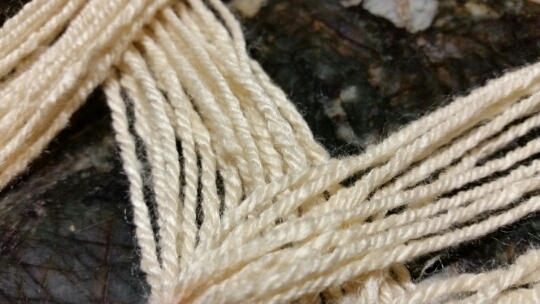 So I got some undyed Tussah silk, and I’ve started spinning it. First, I did one 3-ply skein spun fairly thick. Now I’m spinning thinner with it and yes, it takes more twist very nicely. This entry was posted in Art, Fiber and tagged Arts, beginnings, creativity, Honesty, Merino-silk Blend, silk, Spinning. Bookmark the permalink.